The hideous and blinding light of the fluorescent bulbs in the ceilings of dorm rooms and apartments wield a lot power when it comes to your general emotional well-being. Adding some ambient lighting to your living space will not only improve your mood, but can also function as décor by choosing lamps that cater to your individual style. 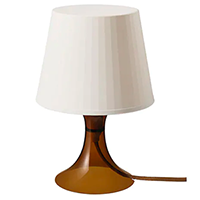 If price is one of your main concerns, the LAMPAN desk lamps would be a great option for only $20, and they’re available in many fun colors. Everyone knows that the most difficult part of small-space living is the lack of storage options for your necessary posessions. 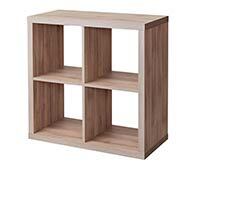 The KALLAX series of storage furniture offers a great solution to this problem. It can be used for general storage, or as a bookshelf for your textbooks. You can also buy boxes to fill the squares and hide away any accumulating clutter. 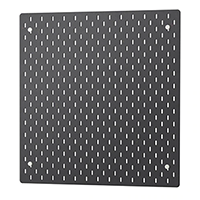 Something I recently discovered at Ikea is the SKÅDIS pegboard, and it has become the organizational object of my dreams. They come in multiple colors, and the most enticing thing about them is the amount of accessories you can purchase to use in combination with the board. Store your writing utensils, attach photos, or basically lay it out any way your heart desires. Plants are unreasonably one of the most underrated items when it comes to home décor. Not only do they make your home feel more cozy and alive, they also purify the air we breathe. 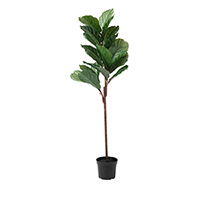 Why don’t you take an hour (or two) to look through the vast variety of plants Ikea has at the end of their warehouse walk-through. Succulents, air plants and many more – all for an extremely reasonable price – some are priced as low as $3! A really simple way to make any space feel like home is by tossing some throw pillows onto your bed or couch – however, throw pillows are often not affordable to those with a budget. 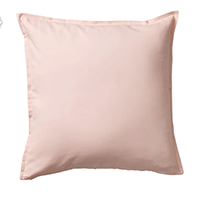 Ikea saves the day again with their many throw pillow options that start as low as $4. They have tons of cushion inserts as well, then you can just replace the covers whenever you’re wanting to shake up your home’s décor. Dishes are necessary, but spending tons of money on dishes isn’t. At Ikea, you can buy many of dishes and kitchen essentials individually or in sets, and all are at a great price. As for bowls and plates, the FLITIGHET 18-piece dinnerware set has all you need and only costs $20. 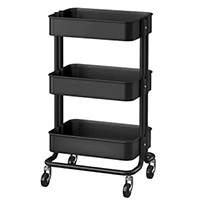 One of Ikea’s more popular items is the RÅSKOG Utility Cart. It’s not only really functional for storage, but it is also a cute way to get organized. Use it as your rolling shower caddy, or to hold your hair/makeup tools – there’s no end to what you can do with this cart. 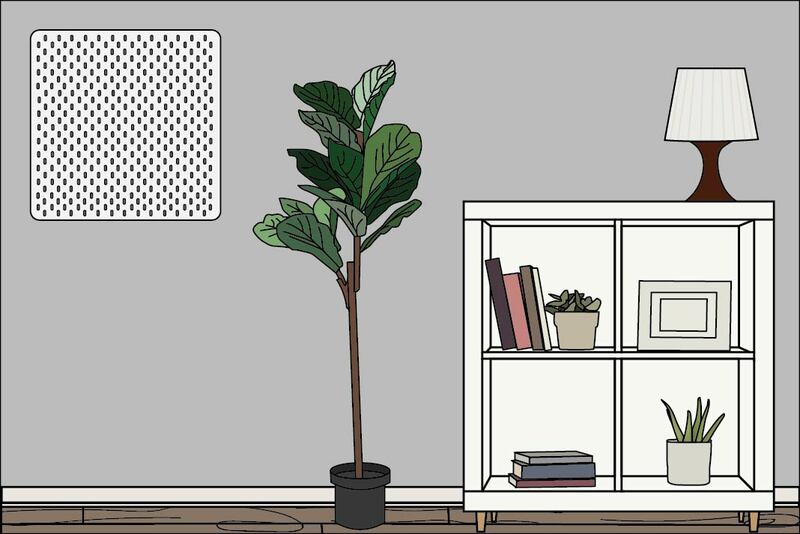 Ikea has wall décor to suit every decorating style. If you’re looking for picture frames, mirrors, prints or any other type of hanging art, you can find them all in the same section of the Ikea warehouse. Laundry is a very unfortunate fact of life. 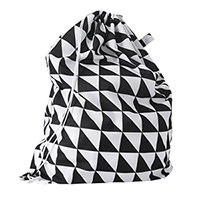 When you’re in a dorm or an apartment complex, you may not have direct access to the machines, so the SNAJDA laundry bag can be used to tote your clothes to and from the laundry room or laundromat. Its cute pattern could (maybe) even make laundry fun! When closet space is limited, the ENUDDEN over-door hanging system can open up coveted closet space that would be used for things like towels, jackets or coats by allowing you to hang them on the back of your door. It’s $7 price tag makes it a no brainer! Ikea is a an often overlooked gem when it comes to affordable furniture and home décor. Next time you’re in the area of one of their stores, stop by and see what all they have to offer, you won’t be dissapointed!